So, I posted on Facebook yesterday that I’m excited to be a teen “shelf curator” for Indy Reads Books, and got a “What’s that mean?” response. So, hey, why not blog about it? Magnolia and I started volunteering at Indy Reads in June. Besides being a beautiful and inviting bookstore with a friendly staff (and the only bookstore downtown Indianapolis), it’s a not-for-profit business. The majority of books sold come from donations and support Indy Reads, an organization with a mission “to promote and improve the literacy of adults and families in Central Indiana.” It’s been really fun to sort books, organize and shelve books, and see them find lovely new homes. And given my love for teen literature, I volunteered to help curate the teen section. This means I get to review stock and pick the best YA and teen books to shelve in the store. I also get to recommend awesome books to shoppers–and recommend awesome books for management to purchase new because Indy Reads Books sells new books as well as used books. And if you don’t see what you want in the store, they can always order it for you at a discount. 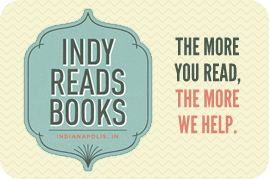 So if you’re into books, or into helping support a great local Indianapolis business, or want to help improve adult literacy in Indiana, check out the store and buy books. And if you’re into helping me create a really fantastic teen section for young adult readers in my community, consider donating your young adult and teen books. Stop in to the store on Mass Ave., email me, or message me about book donations.